Tim Albin was animated last Thursday as Ohio began to practice for its next opponent. “Have you ever lost to Miami?” Albin barked multiple times as the Bobcats stretched before practice. Albin, the Bobcats’ offensive coordinator, has been with the program for 13 years. He and defensive coordinator Jimmy Burrow have been with Frank Solich since 2005, Solich’s first year of coaching the team. In 13 years at Ohio, the trio has only lost to the RedHawks twice. The Bobcats are the losing team in the rivalry – the RedHawks hold a 52-39-2 series lead. No player on the Bobcats knows what it feels like to lose to the RedHawks, and no player wants to know that feeling. The 94th meeting of the “Battle of the Bricks,” will take place at 8 p.m. Tuesday at Peden Stadium. The game will be televised on ESPN2. The week of practice leading up to the Miami game is a special one for Ohio. Albin said he had about 15 former players — Tyler Tettleton, Jordan Thompson and Eric Herman to name a few — text his phone that Thursday. They all wanted to let him know that it’s Miami week. Ohio prides itself on preparing for every game the same way. In terms of preparation, not too much is different for Miami. The Bobcats are instructed not to wear red in the days leading up to the game, but that’s the only stipulation. Still, the Bobcats will play with an extra edge when they play the RedHawks. “Nothing is sweeter than beating Miami,” Quentin Poling, a redshirt senior linebacker, said. For four out of the past five games, the Bobcats have tasted sweetness. The last time Ohio lost to Miami was in 2012, when Ohio was ranked No. 23 and boasted a 7-0 record. Now, the team’s seniors are focused on leaving the program without ever having lost to the RedHawks. Every time the Bobcats beat the RedHawks, each player receives a mug. It’s ceramic and about the size of a beer mug. A Bobcat, the score of the Miami game and the team’s season accomplishments graces the mug. Redshirt senior wide receiver Brendan Cope wants to add a fifth mug to complete his collection. The Bobcats (6-2, 3-1 MAC) are ranked second in the East division, with the RedHawks (•3-5, 2-2 MAC) right behind in third. Akron leads the MAC East at 4-1. A loss against the RedHawks could mean more than just a Bobcats loss for the third time in 13 years against their rivals. After winning in 2012, the last time the RedHawks came close to beating the Bobcats was in 2014. 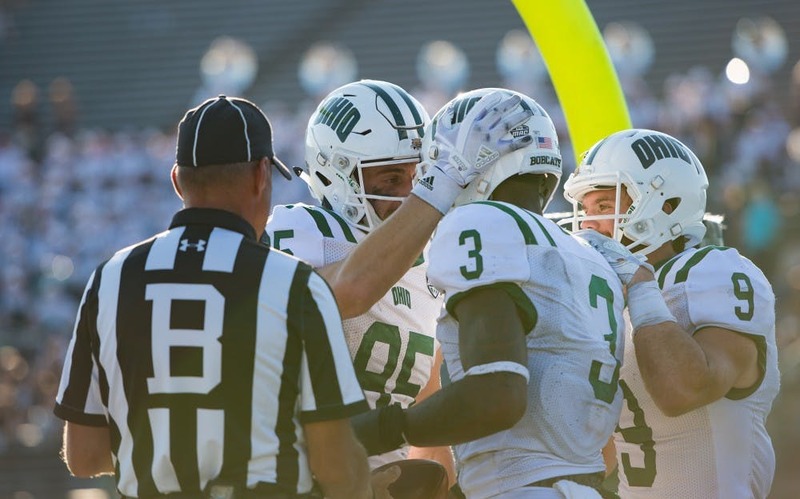 It was the last game of the season, and Ohio needed a win to become bowl-eligible. And it surely couldn’t lose to Miami. After being down 21-0, the Bobcats came back and tied the game in the fourth quarter. With 1:08 left to play, Ohio had the ball and a chance to win in regulation. Cope, who was a redshirt freshman at the time, remembers his catch vividly. The Bobcats were on the RedHawks’ 49-yard line. Former quarterback Derrius Vick threw a 38-yard pass to Cope. Then, former kicker Josiah Yazdani kicked a 28-yard field goal that won Ohio the game. The feeling of setting up the game-winning field goal was unforgettable for Cope, so much so that he doesn’t think he’ll able to top it for the rest of his career. Still, one last win against the RedHawks is what he needs.